[AUTO](VC):When it attacks, put up to one card from the top of your deck face down as an equip gauge for each of your rear-guards. This unit gets [Power]+5000 until end of that battle for each of your rear-guards. 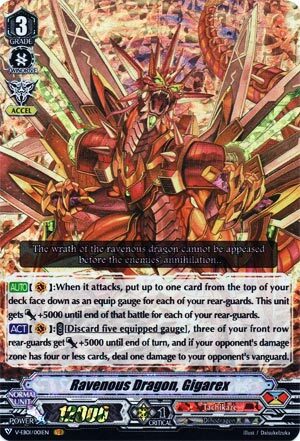 [ACT](VC):COST [Discard five equipped gauge], three of your front row rear-guards get [Power]+5000 until end of turn, and if your opponent’s damage zone has four or less cards, deal one damage to your opponent’s vanguard. RULING: When using this card’s first skill, you’re allowed to give one rear-guard one equip gauge, then not give another rear-guard one. You don’t have to give equip gauge to everything, or nothing. Okay, so we have a massive overhaul to Tachikaze by gaining a new mechanic completely exclusive to themselves. Equip Gauge is basically like soul for rear-guards, and you get effects depending on how much gauge they racked up. And this can grant an automatic free one to a rear-guard for every swing this makes. The second skill I’m sort of iffy about. You need to commit to a pretty decent board and hope that your full-field lives to the next turn, and no deck, Kagero especially, will let that slide. They’ll be swinging at at least one front row every turn just to stop the free burn and columns, forcing you to just not get the skill, or burn your already precious hand. Then again, in the old days no one used CEO Amaterasu for the Megablast even when she could use it, so I guess this is sort of the same: just equip gauge to proc RG skills. Like all VRs, a staple at 4.